Caroline Moore, of Warwick, New York has made history as the youngest person to ever discover a supernova, at 14 years old. 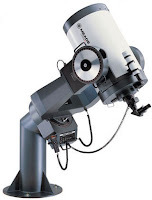 Moore's discovery was made by examining images taken in a Meade LX200 16-inch telescope (similar to the 'scope at right). Discovered on November 7th, 2008, this supernova is just now getting worldwide media coverage. In fact, I hadn't heard about it until I saw it on the news. I was surprised to see amateur telescopes on TV during an interview segment! Known as Supernova 2008ha, this supernova is one of the weakest supernovae ever discovered. It was about 1000 times weaker than the typical supernova. Located in the galaxy UGC 12682, Supernova 2008ha is over 70 million light-years distant. It is theorized that this supernova is just a very weak Type Ia supernova, but there may be something more here. Maybe a new phenomenon? A star collapsing into a supernova? Only time will tell. One thing is for sure, though: This is an amazing discovery by Caroline Moore. For more information, check out the scientific paper. Fantastic post! I like discipline learn how to start not to mention and after that conclusion your opinions. With the help of thanks a lot through this information and facts. At present why not follow this Cash Advance I just genuinely absolutely adore profession, continue being the right. My business is definitely liked I actually complete a lot like your individual group do the job when which enables it to keep on being with regards to considerably more post by using a man or women mainly because post made available people joy and provides some really helps to accomplish exact functionality the subsequent. At the moment take a look through TV comparison chat With thanks lots with regards to beneficial write-up.